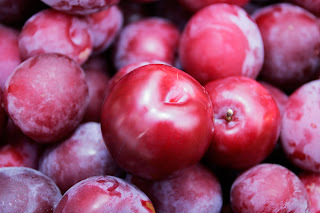 EaseMyHealth-Healthposts: Plums - the lesser known fruit full of nutritional benefits! Plums - the lesser known fruit full of nutritional benefits! There are very few fruits that have such a bright vibrant colour as the plum. On a trip to the local fruitwallah during plum season, they are very hard to miss. Did you know that when plums are dried, they are known as prunes and give large amounts of energy to the body? Plums are an excellent source of vitamin A; vitamin K and vitamin C. Plums are zero in fat, saturated fat-free, sodium-free and cholesterol-free. They are also an excellent source of fiber. A single plum has around 36 calories which makes it a dieters dream...less than a bread slice! Plums are one of the few fruits that are extremely suitable for diabetics as they are low in the glycemic index. Plums have also been tested to prove that they are good laxatives. The vitamin C and phenols in plums have antioxidant qualities these as Ialways say are the little soldiers that help prevent diseases. Plums are also beneficial for the eyes and helps prevent macular degeneration. They boost immunity and improve cardiac health as well. Plums have more nutritional benefits than anyone imagined! Did you know that plums assist in iron absorption? So for all of you out there who are taking iron supplement: try a plum for a change. While buying plums, look for plums without cracks or soft spots. They should give way only when slightly pressed. If they are ripe when you buy them, they should be stored in the fridge. To ripen them, store them at room temperature. Plums have more nutritional benefits than anyone imagined!